Trapping fur bearing animals is tough work but deep snow can put trappers out of commission. Don’t let it! Foot hold traps bedded in dry dirt under the cover of trees will keep working even when the snow piles up. Look for tracks from animals like fox or coyote and follow them until the pass by a location where the snow is prevented from accumulating on the forest floor. Rub a good gland or food based attractant to the base of a tree or on a rock instead of trying complicated dirt hole or baited sets. If the tracks are going by there it won’t take much too make them stop. To prevent frost from freezing your trap down lay waxed paper under the trap before bedding. When temperatures stay cold, pine duff can be a good material to cover your traps with to keep the set looking natural. 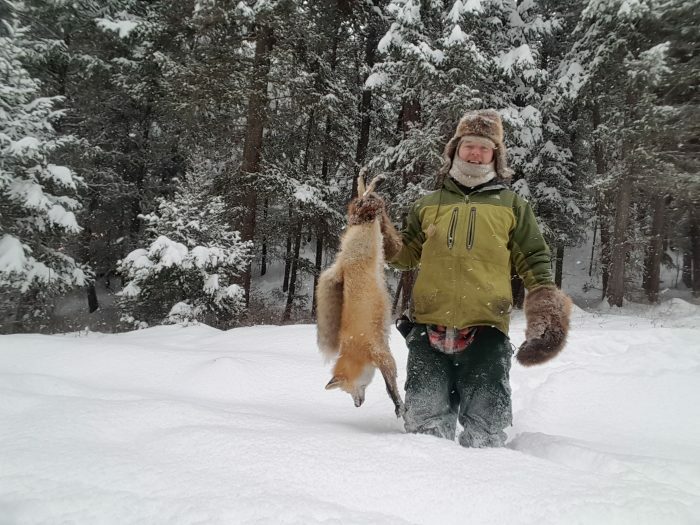 Knowing your target species’ habits and travel routes will create a need to keep your skinning knife sharp. Good luck!